I absolutely love this time of year in dynasty fantasy football. The excitement of fantasy league playoffs has barely worn off, but we also get to immediately turn our attention to evaluating the fantasy potential of the next cohort of players entering the league. A prevailing theme of the 2018 season was a return to relevance of the running back position. With that in mind, I want to share a little bit of my process for identifying rookie running back targets. I largely avoid running backs who aren’t drafted in the first three rounds of the NFL draft. There’s a huge difference in how these players are handled by NFL general managers versus Day 3 draft picks. The former group generally gets the first crack at winning positional battles and seemingly holds a draft position trump card for any ties throughout their careers. When I’m spending a valuable dynasty rookie draft pick, that matters. An average of seven running backs have been drafted in the top three rounds of the NFL draft over the past five seasons. Considering the variable needs of other teams in your dynasty leagues, that means you’re almost assuredly going to have a shot a selecting a running back with a decent shot at early-career playing time with one of your rookie picks. The players in the cohort are a bit of a mixed bag for fantasy purposes, with two who became immediate impact league-winners, two who had flex utility, a player who barely made a peep, and Rashaad Penny, who it’s still too early to judge. Only five of the six actually played running back in college football. McKinnon was primarily a quarterback, save for four games in his final season. This made him a unique prospect in general and for that reason I didn’t use his data for the analysis. Below are the college stats against Power-5 and non-Power-5 opponents for Penny, Hunt, Johnson, West, and Archer. Looking at their career splits versus Power-5 and non-Power-5 competition, it is easy to see that Penny, Hunt, and Johnson all performed essentially with the same efficiency regardless of the quality of their opponents (within tenths of a yard). In an ideal world, I’d have elusiveness or some other yards-created style metrics available for each of the players that far back, but I don’t, so that’s why I used yards per carry. West and Archer were noticeably less effective on a per-carry basis against Power-5 competition, with each averaging at least two yards per carry less against quality opponents, and this being over sample sizes of at least 30 carries for each player. Not only did their yards per carry diminish against tougher competition, it also fell to below 5.0, which is highly concerning for any college running back. Looking forward to the 2019 running back class, which backs with potential top-three round grades from non-Power-5 conferences should we be targeting? 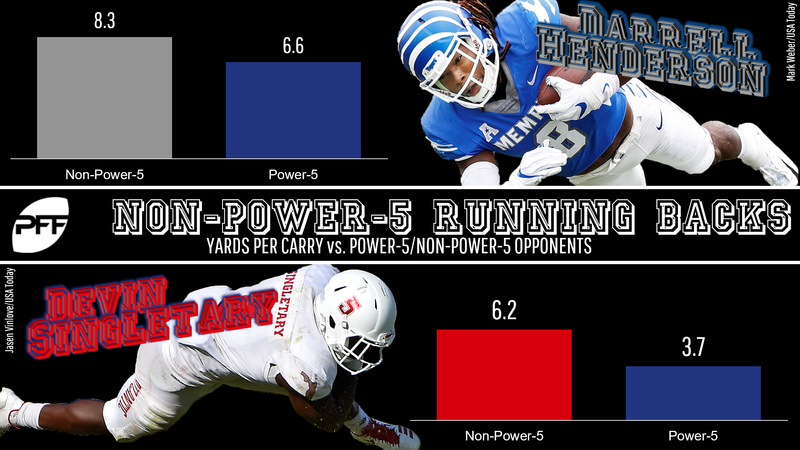 In early draft conversations with analysts around the industry, and judging from early mock drafts, there are really only two running backs from non-Power-5 school who have a chance of being selected before the end of day two of the draft: Darrell Henderson (Memphis) and Devin Singletary (Florida Atlantic). For the purposes of the exercise, let’s assume both of these players do actually get selected by the end of the third round in 2019. What did their Power-5 splits look like? Both players saw a nasty dropoff against stiffer competition on a per-carry basis over the course of their collegiate careers, with Henderson averaging 1.7 yards fewer per attempt and Singletary averaging 2.5 fewer. In Henderson’s defense, despite being somewhat less effective, his 6.6 yards per carry was still an outstanding number against Power-5 competition, on par with Kareem Hunt. Both of these backs are also on the smallish side; however, in recent memory players such as Devonta Freeman and Christian McCaffrey have found success despite being closer to the 200-pound mark. Obviously, prospect evaluation is a complex process and we will learn a lot more about these two players in the coming weeks. However, judging by the NFL effectiveness of non-Power-5 running backs drafted in the top three rounds over the past five years and the data we have on Henderson and Singletary, I recommend in favor of Henderson as your preferred target, as long as he is selected in the top three rounds of the draft.